Hot on the heels of Chalkpit Records’ recent announcement advertising their expansion in Leeds, the label are ready to hit the ground running with the news of their debut promotional show in the North of England. Taking inspiration from Catfish and the Bottlemen, Follow The Giant have been capturing audience attention with their catchy choruses and blistering indie rock. Hailing from the York/Leeds area, Follow the Giant are ready to set the tone for Chalkpit’s debut event. The final act added to the lineup is Silvertones, who have broken ground with their clever lyrics, healthy cynicism and throwback indie vibe. Citing bands like The Cribs and The Strokes as inspiration, Silvertones are the perfect act to round off the lineup. Glynn Parkinson from Chalkpit Records said, ‘This first show up North is set to be a killer night of music, we’re really aiming to set the bar high in terms of what our live shows will be like’. 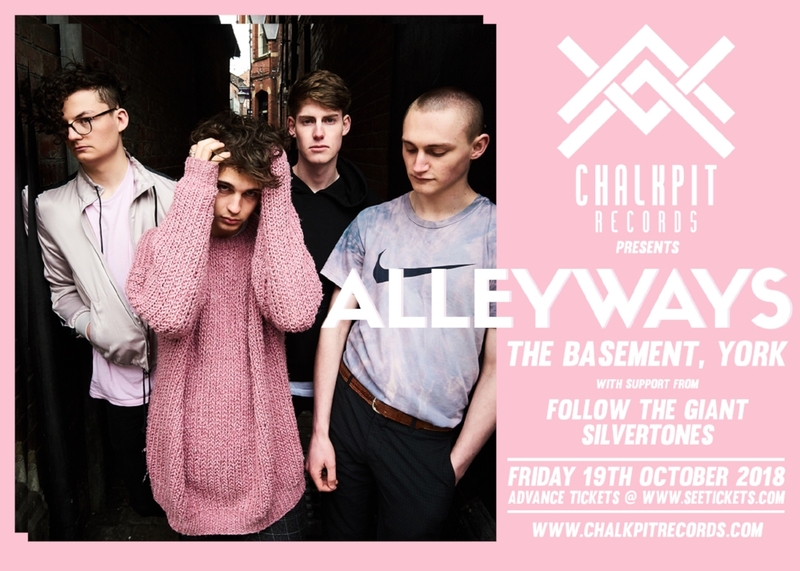 Don’t forget to check out Alleyways and Follow the Giant on Spotify, while you can find Silvertones on Soundcloud.